It was great to finally get to see the much anticipated Big Gold Dream on Saturday when it received its first national showing on the BBC. Even at 90 minutes it was never going to be able to fit everything in from what is now known as post-punk but it did a good job telling the story of Edinburgh’s Fast Product and Glasgow’s Postcard Records. As somebody old enough to have been there at the time I never remember the phrase post-punk being one we used but it certainly defines a period now that was after punk but before indie labels really came to the fore. 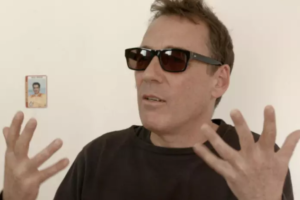 In fact the claim that indie labels first started in Scotland, influencing those that followed such as Factory, was made well and while Bob Last and Hilary Morrison were both there to tell the story of starting Fast, even without the enigmatic Alan Horne – the label supremo at Postcard and founder along with Orange Juice’s Edwyn Collins and David McClymont – there was enough, including stories from David himself, to give a real feel for how things started. While other bands like The Associates were mentioned there should at least maybe have been a nod to bands like Simple Minds and Skids, though as I say in the time they had there was never going to be a definitive version covering all bases. 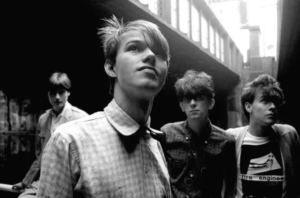 The follow up Teenage Superstars, covering the mid to late-80s, is again looking promising featuring as it will the Shop Assistants, The Pastels, Teenage Fanclub, Jesus and Mary Chain, Primal Scream and labels like 53rd & 3rd and Creation. The recent Lost in France film covered the early days of Chemikal Underground in the mid- to late-90s and again featured some great names in The Delgados, Arab Strap, Franz Ferdinand and Mogwai among others. Possibly there is one more to be made, Fence Records – The Movie, for the late-90s and noughties. However, I doubt there will be another documentary or film made about more recent times. Obviously there have been several great bands since then and a few good labels but there has never been quite the same scene again. The Scottish music industry should consider just leaving young folk these days to get on with things and maybe what would come out might be more interesting than the rather regimented scenes we have now. Then again maybe now that there are so many music schools and courses that just didn’t exist all those years ago we will never see a “scene” anywhere again. I’m sure there will be many who will point to all sorts of things as disproving this but really it is because they do not understand how things were in those earlier times. I say all this as an outsider who simply went to gigs and was no part of that inner sanctum in the late-70s but there was undeniably a feeling that things were exciting though, as I’ve said many times since, we never realised that some of the gigs would with hindsight be seen as very special indeed. Of course what the documentary did bring home to me was the scale of what I’m trying to achieve with the History of Scottish Music Centre. Covering over 50 years and many genres, I was always aware of the enormity of the task but the one consolation I have is that I will be able to constantly add and adjust as time goes on. Lots of news to come soon on the centre’s first exhibition but for now I can highly recommend watching Big Gold Dream on the BBC’s iPlayer and buying the Lost in France DVD. As for all that “things were better in the old days” stuff. Maybe that’s just the ramblings of an older middle-aged man. On the other hand it is very noticeable that so many of the band members from all those eras if not the labels are still around making music. Maybe that is the problem. Scotland is now full of good music and there isn’t space for any more as those of us old enough to still buy music stick with what we know.